The raccoon (Procyon lotor) grows quite large. Males will often weigh 60 lbs. Raccoons that frequent urban areas often grow larger than their forest-dwelling relatives because food from trash cans, fish ponds, pet food bowls and gardens offer easy pickings. A garden pond often poses an alluring location for raccoons. The raccoon sees the pond as an easy area to catch fish. Once a raccoon discovers a pond with fish, it will return every night until all the fish are gone. Always provide safe havens for pond fish to hide under or aquatic plants for them to swim into to avoid the avidly fishing raccoon. Place motion-activated lights or water sprinklers around the pond to scare off the raccoon. Raccoons are nocturnal and often shy away at lights that suddenly come on. Placing solar-powered garden lights around the perimeter of the pond often works to keep back skittish raccoons from the shoreline. Place speakers or a radio by the pond. Turn it on low. 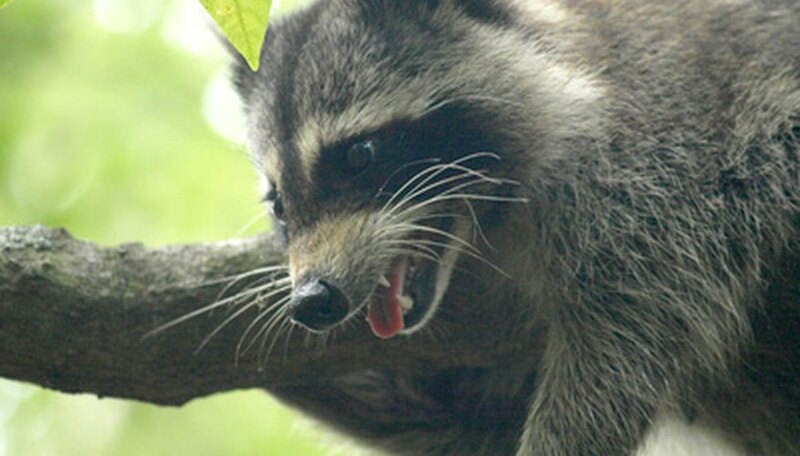 The sound of human voices will often keep raccoons away from the area. Put the volume on a low setting so you don't disturb your neighbors. Roll chicken wire over the surface of the pond. Hold the wire down using rocks or garden stakes. The wire will help keep the raccoons from nocturnal fishing. Fence in the pond using electrical fencing. Place 2- to 3-foot fence posts around the perimeter of the pond. Apply electric fence insulators to the fence posts. Place two on each post. Run electric fence wire 6 feet from the ground and around the pond. Attach to the fence posts using the insulators. Run another wire 6 inches above the bottom wire and also attach to the remaining insulators. Attach the electric wire to a garden electric fence charger. You can also buy solar-powered garden fence chargers. Never corner a raccoon. Many raccoons will bite if cornered. Never handle raccoon droppings because they carry a parasite that can prove fatal, according to the Washington Department of Fish and Wildlife.